CRESTLINE — The Crestline Bulldogs played host to the River Pilots from Hannibal on Friday evening for their annual homecoming game. Unfortunately for the ‘Dogs, it would be a bittersweet homecoming as River brought a strong defense and marched to a 42-7 victory over hosting Crestline. With the loss, the blue and white fall to 3-5 overall on the season. 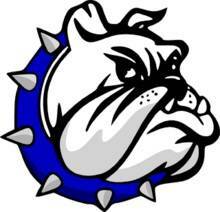 In week nine action, the Bulldogs will head to Ashtabula for another meeting with the St. John Fighting Herald. The two teams will clash on Saturday, October 20 at 2 p.m.
River would strike first, scoring on a two-yard run in the opening quarter but would be unable to convert the two-point conversion to take the lead; 6-0. Later in the quarter, Crestline would score their only points and take their only lead as Kaden Ronk caught a Ty Clark for an 11-yard touchdown. Logan Parrella would convert the extra-point attempt to put the ‘Dogs up; 7-6. The Pilots would score twice more in the first half of Friday’s rainy contest. Their first score would come on a 32-yard pass with the second coming on a one-yard scamper. Both times, River would be unable to convert the respective two-point conversion attempts but would take the 18-7 advantage over their hosts into halftime. In the third quarter, the visiting Pilots’ defense would score the team a pair of touchdowns. After a Crestline fumble, River scooped up the blunder and dashed in from 18-yards out. With the two-point conversion, the Pilots moved ahead; 26-7. The second defensive score came via a Clark interception returned 29 yards for the “pick-six” and with the two-point attempt successful, the visitors moved ahead 34-7. River proved that their were not finished scoring yet and added their final points via a 61-yard run, followed by another two-point conversion to put the score at the eventual final of 42-7. Crestline managed just 214 yards of total offense (37 passing and 177 rushing) while River posted just 215 (109 passing, 106 rushing). Each squad committed three penalties apiece on the night, costing the ‘Dogs 20 yards and the Pilots 15 yards. The Bulldogs had trouble holding on to the ball on Friday, committing a total of eight turnovers; six fumbles lost and two interceptions. Dakota Wireman led the ground game for Crestline, picking up 61 yards on 10 carries. Caleb Moore earned 54 yards, also with 10 carries. Ethan Clum ran to 49 yards on 12 carries but lost two fumbles on the evening. Clark finished at 5/17 passing for just 37 yards and two interceptions but did have the TD thrown to Ronk. On the ground, Clark carried the ball four times for 13 yards. Moore was the top receiver in the contest, making two catches for 17 yards. Ronk finished with just the one catch for the 11-yard score while Wireman caught the other two Clark completions for nine yards. Defensively, Wireman, Clark and Ronk all had fumble recoveries and Calvin Reed earned the team’s only interception.